Tomorrow at 12:30 PM, the NCAA Selection Committee will announce the 62-team field for this year’s 2013 D3 Championship Tournament. There are 42 teams automatically-qualified based on conference championships (Pool A), 1 non-automatic-qualifying conference championship (Pool B), and 19 at-large bids. The first 42 teams will be known to everyone by tonight as conference tournaments wind down, but the final 20 will be decided upon based on a variety of factors (for more details on this process, see here). Middlebury, of course, is hoping to grab a Pool C bid. Below, we have listed the 42 Automatic Qualifiers, and made our projections for the final 20 spots. 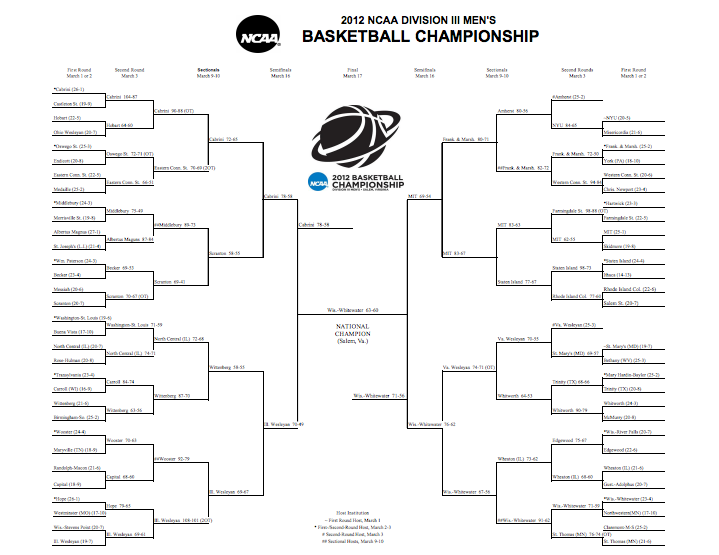 The predictions are based on who we expect to make the tournament, not who we think ought to make the tournament. Pool C is listed in the order we expect them to be placed. *We have a limited understanding of Pool B; thanks to Pat Coleman for the help. *Thanks to the indispensably valuable contributions of “Titan Q” of d3boards.com (see here) and the Forever Faithful Blog’s regional rankings page.